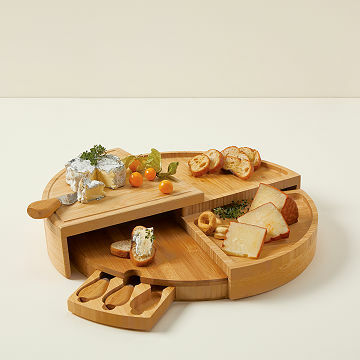 This bamboo cheese board converts to a multi-level wheel and incorporates storage for serving tools. Taking its cues from a wheel of cheese, this unique design starts as a wedge, and transforms to a tiered server for your favorite cheeses and appetizers. Choose your size: classic, which includes a stainless-steel all-purpose cheese knife, and cheese fork or large, which also comes with a flat cheese knife. As an added bonus, the flatware stows in a small drawer inside the board. The comprehensive, compact set has everything you need to create an impressive spread at your next party. Made in China. Hand wash and dry immediately with a clean cloth. Do not let soak in water. Great gift for those who entertain! I've purchased this cheese board twice as gifts. Love everything about it - from the compact design to the swivel - makes a beautiful presentation. Everyone asks where I found it! Thanks Uncommon Goods! This is not only practical but beautifully made. Good for everyday as well as occasions. Mostly for entertainment since I bought the biggest size. But it is also used on a daily basis. It is easy to clean, easy to store. Cleverly designed. This is a great party piece and functional as well. I would recommend this products. I may keep this for myself! This will be perfect for any size entertaining because the formation can easily be adjusted. Love the wood and the handy tools! I have used this board for charcuterie and cheese appetizers for guests. Fun presentation with the different sections/levels. Storage is nice to when collapsed. It is something I would definitely purchase again. People will notice this unique Cheese Board! This is a lovely cheese board that can be used not only for cheese and crackers but for a very nice charcuterie spread. The way it blooms from the center and then closes down into a wooden cylinder is really neat. This is not something the bride and groom will not receive two of and will probably find it is one of their favorite pieces of serveware.